Why is it so hard for us to do things simply because it is good for us? Too many of us do things out of force instead of taking initiative. Partially this is because we lack motivation. Without pain, stress, panic, or reactivity we rarely pursue anything that poses the slightest difficulty. What would our lives look like if we did things on purpose? What if we lived intentionally? How would our world look if we wrote down our vision and pursued our goals just because it would benefit us and those around us? You could see the light come on in our daughters head. She was not made to feel stupid. She was not yelled at. She was not belittled. She did not have to hide in secret her hearts desire to have something. She was instead guided through the process of making a good choice for a good reason. As a child she thinks like a child, as an adult we need to think like adults. It is all too common to find many who are adults in age but not in thought and especially in action. There are many that live in response to circumstances instead of creating a lifestyle of good habits. If we are not driven by pain or the threat thereof, we are driven by performance. We care about what people think of us. How others view us affects our response to a situation. If we set our standards low enough we can live up to them. We will save face. We have an innate sense of failure, and therefore we lack the ability to risk. We live “safe” in “doing things” because we are afraid. We hide behind “hard work” (manual labor), “laziness” (out of balanced priorities), or a myriad of other excuses to keep us from success in any area. We have greatness inside of us. We have ambitions, aspirations, and hopes. Ironically, we avoid achievement. The work is strenuous, tedious, and requires patience. Mistakes can be embarrassing. No matter how much we practice we discover we can never obtain perfection. We have bought into the lies that we are not good enough one way or another. The odds are never in our favor so we relinquish follow through. We end up suppressing our heart and settling. On the flip side, we hide our insecurities with arrogance, self-righteousness, and pride. When we have shortcomings we tend to hide them. We don’t let people walk with us through our struggles. We take independence to an extreme. We isolate ourselves and consequently we repeat the same ol’ behaviors. This causes us to validate our feelings of inadequacies and incessant failures. Once this occurs we tend to play life’s victim. Swinging to the opposite end of the pendulum, we are open to being controlled. If I can’t get things right, I need someone else to tell me what to do. Then if I fail, I don’t have to take responsibility because it is all their fault. We close ourselves off from walking in relationship as those can be messy. There is conflict involved, disagreements, and collaboration. We don’t know how to master a craft. We often give up too quickly. We want it now or we are on to the next thing. We are broadly focused and not single minded. We spread ourselves too thin and get discouraged when we desire a simple solution. The “hard work” and effort it takes to complete a task we set out to achieve often requires requires extreme focus. Keeping our eyes on the prize is a necessity. Continual recalibration is important if we are going to hit what we are aiming for. Keeping this in mind, it is important to note we do not have to be on top of everything all of the time as long as we keep on going. We have to learn to balance our here and now needs with the pursuit of dreams without compromising one for the other. We tend to lack intentionality and get scattered by the wind. On the other hand, we can hold on so tight we abandon everything else for the cause. We also have a hard time taking the pressures of adulthood. We struggle with feeling overwhelmed, incompetent, and surrender to the disappointment of unfulfilled expectations. Dedication, perseverance, and achievement provide greater satisfaction with a higher pay off. 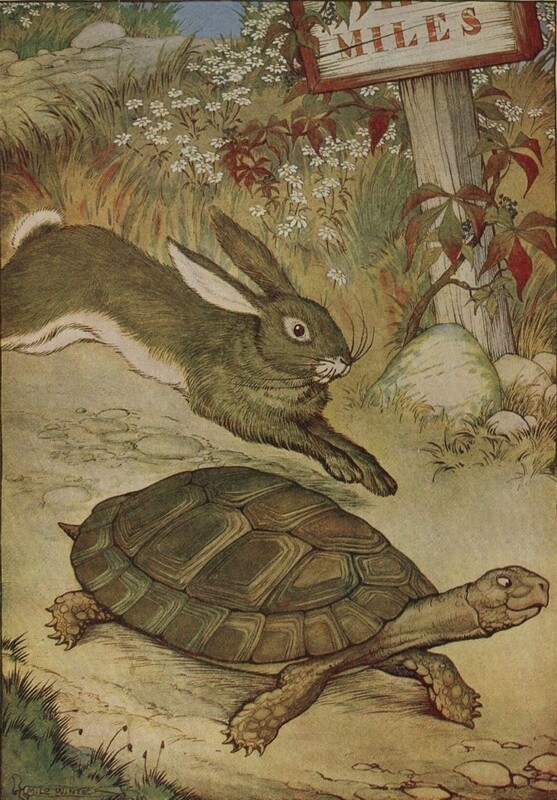 Like in the story of The Tortoise and The Hare, if we are good at something and it comes natural, oftentimes we think we have nothing to learn. So, like the Hare, we fail to grow only to be passed up by someone with less skills who has remained faithful to the cause. Tortoises with intentionality do not get wrapped up in the highs and lows, but stay the course. They will enjoy the journey and not fret over who is passing them up. Eventually they know they will make it to the finish line.